Nobody likes getting lost, let’s be honest. It’s frustrating, because there’s usually somewhere else that you’d rather be, and unless you happen to be lost on a beach in Hawaii somewhere, you just want to get to your destination. Even worse is when you keep ending up going in circles – at least if you’re seeing new territory, it feels like progress is being made. Being lost isn’t any more fun in video games. Last week I talked about how Dice Poker in The Witcher 2 features a UI that is an exercise in needless frustration. 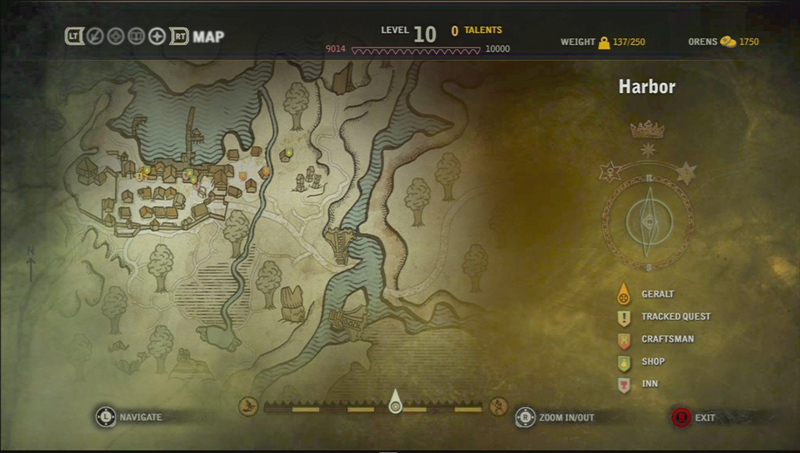 The Witcher 2 makes another appearance on that game’s ux this week because the game makes it nearly impossible to figure out where you’re going. And there’s not even anybody that you can ask for directions. 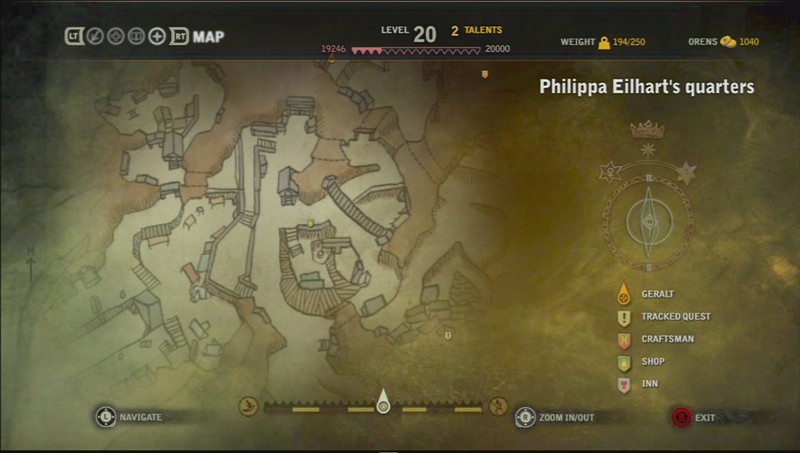 From looking at the map, you’d think there was a town, mostly surrounded by plains, with a few main paths that run out of town. In reality though, the town is actually in the middle of dense forest. And those “paths” do technically exist, but so do a ton of other unmarked paths, all of which are windy and twisty and probably don’t take you where you want to go. It has the time of day, but doesn’t list north. One of the major problems with being lost in the forest (in real life) it’s hard to keep going in a straight line. When all you see is trees, you’ve got to have an incredible sense of direction to keep your frame of reference intact. Or, like the Boy Scouts tell you, just bring a compass. Surely, a professional Witcher like Geralt of Rivia could be able to tell you which way is north, right? Apparently not. Amazingly, the minimap doesn’t feature “north” anywhere. There is a tiny arrow that points to your destination, and an indicator of what time of day it is, but a cardinal direction isn’t included, and it would be super helpful. A quick side note – while those little shields might look great on your computer monitor, they are terrible on a TV. It’s clear that the game was ported to the XBox, because it’s pretty much impossible to tell them apart on the console. If you look at that map, you might think it’s just one big area with a few houses in the middle. Unfortunately this couldn’t be further from the truth – there are large dividers between various parts of the city that aren’t listed here at all. There are some hills and some valleys in the town. And a ton of enterable houses. None of these things are even hinted at on the map. And there are a lot of named buildings in town too – there’s an inn, a brothel, some royal homes – none of these are listed on the map. 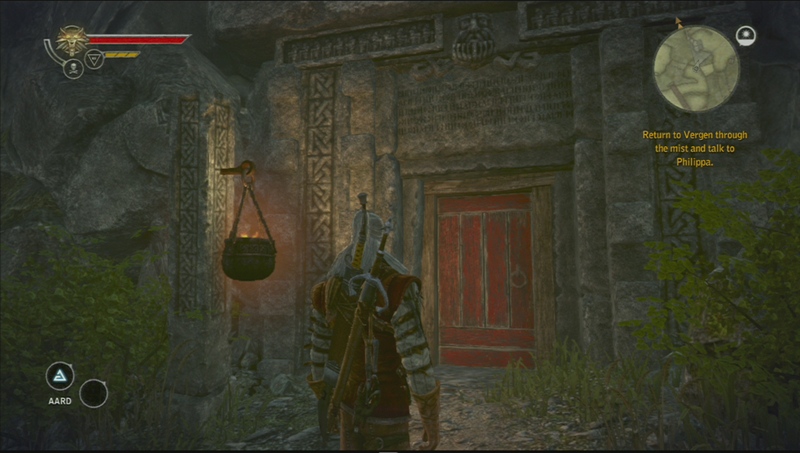 So if you forget where something is located, that means either trying to interpret the small, poorly lit signs out front, or a lot of entering random doors to see what happens (and a lot of loading screens). But let’s get to the real fun stuff in Chapter 2, where the game moves to the town of Vergen. Incredibly, if you zoom out too far I instead get transported to a world map view of the world. First, there’s essentially no reason for me to ever refer to the world map. Sure, if I for some reason cared to see where all the game’s locations are in relation to each other, I might be able to do it there. But this world map isn’t even in English, so there is no way for me to use this even if I wanted to, which nobody actually does. To not let me zoom out to see the whole city, when it’s as big and complicated as this one, is insanity. That’s not all – get this – once you get outside the city walls, there’s all kinds of area to explore. So if the game insists on zooming out to some other wider view, why not the surrounding area? It would at least have some potential to be useful, unlike the world map, which is an absolute waste of time. Anyway, back to the map of Vergen itself. Among the things that the map does a terrible job at is conveying the massive change in elevation among the city. The town was built into the side of some hills, so there are ledges that cause inaccessible areas everywhere. Sometimes being right next to where you need to be means that you still have a long way to go because you have to figure out how to get to the right elevation. Really? That’s the exact same door. Sure, the surroundings aren’t exactly the same, but come on, you’ve got to give us some kind of help for what’s on the other side. All of this is ignoring the painfully terrible mission tracking system that either points you at the wrong location, or just doesn’t give you any clues at all. I’ll leave you to watch this video where someone is hilariously angry about how miserable that is. I’ve spent way more time in Vergen trying to get un-lost than I have actually fulfilling missions. It has been ridiculously frustrating. I’m sure the developers will tell you that maps in the middle ages weren’t that good, so this is what people had to deal with. Or that the player is supposed to learn the town’s layout to get “immersed” in the experience of being there. However, I happen to know for sure that visiting countless loading screens while trying to find the inn wasn’t a concern in the middle ages. I also know if I was actually receiving beer from the inn, you’re damn sure I would know how to get there like the back of my hand. The book Inner Navigation: Why we Get Lost in the World and How we Find Our Way, talks a lot about getting lost, and what happens in our brain when that happens. The author proposed that we are constantly building a “cognitive map” of the area around us, and our brain uses that to get us around in the real world. Unfortunately, when you’ve got a complicated town like Vergen in a middle-ages era game, it’s really hard to get any sense of where you are. Probably because 1) you’re not playing the game 24 hours a day like you are living in real life and 2) the entire town is various shades of gray, with very few distinguishable landmarks to guide you. There are a lot of ways that the map could be helped – just plain ol being better is one easy one, though perhaps that’s a cop out. 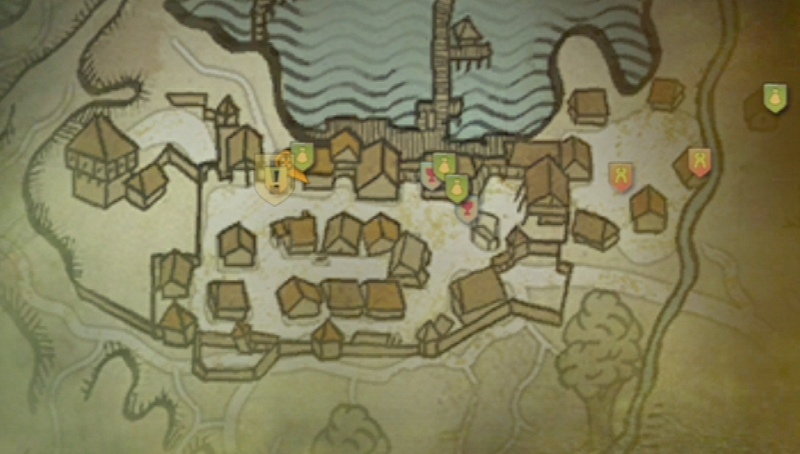 How about including a list of the town’s important locations, and letting the player set one of those as a destination? 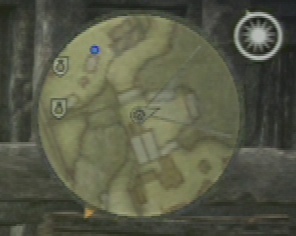 Even including a compass on the mini-map would make a huge difference. At least, let me ask the neighborhood peasants for directions. After 15 minutes of trying to find some random guy’s house, I’m not too proud to ask for directions. Where’s Siri when you need her? This entry was posted in Action, Console, review, Role Playing and tagged flotsam, game design, game usability, getting lost, maps, maps in the witcher, the witcher, usability in gaming, user experience, ux, vergen, xbox 360 by mark d. Bookmark the permalink. 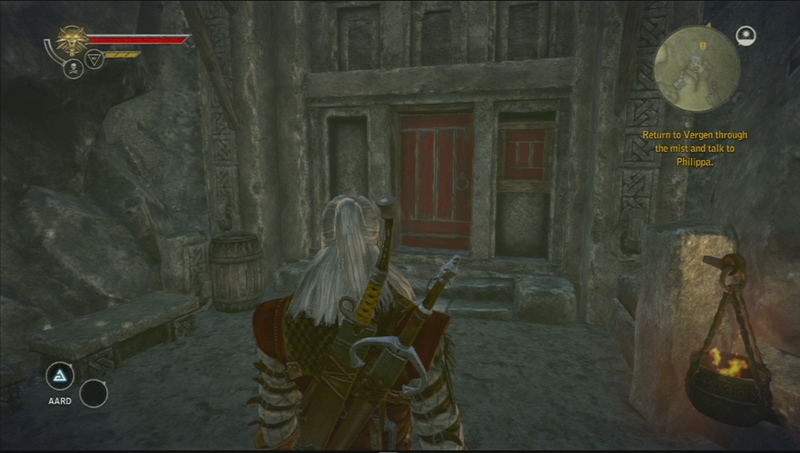 I’m playing Witcher 2 for the first time and I’m experiencing the same issues you’ve described. It’s frustrating as, hell-O! The video you linked of the angry guy is the same quest I’m doing now with the same f***ing issue. Just stopped playing dark souls because I died so much and thought “oh, lets chill for a while with some witcher 2.” Now to let my rage out on battlefield 3 AAARRRGGGHHH. the map is aaaaawfull, can the developers release a patch. Come on cd project. This is plain WRONG. Perhaps what you need is a huge floating arrow telling you were to go. Perhaps it would be so impressive if a witcher could magically create a gps. LOL love this man..I am having same issues in Vergen…I stumbled to the catacombs but cannot find anything! Nothing is explained! I finished Witcher 1: Enhanced Edition and am now playing Witcher 2: Assassin of Kings Enhanced Edition. It’s a frustrating regression to not have more map detail! I am currently on chapter 1 and already frustrated by guessing where I am going, greeted with walls not on the map, etc. I had hoped in the years the game has been out this would have been addressed. I hope Witcher 3 does better. I’m playing this game (for the first time) in 2017 and I am completely lost in the dwarf town. I can’t say I’m enjoying the game much so far. 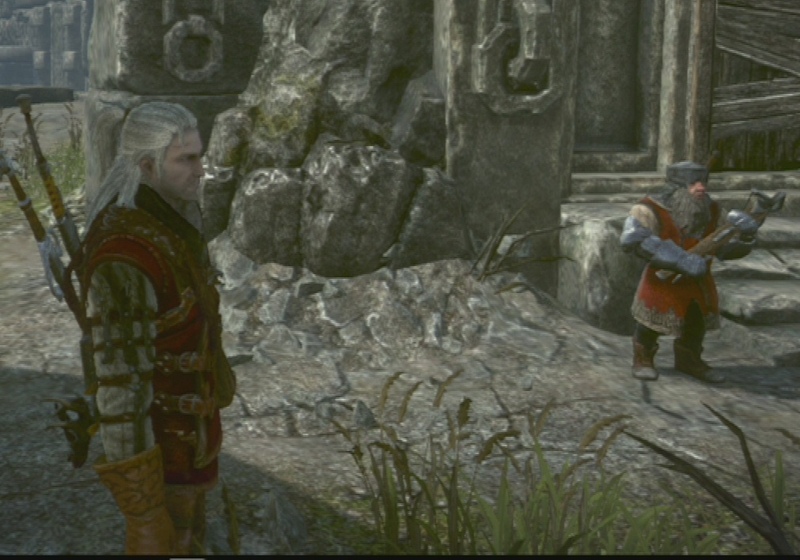 The Witcher 2 seems like it has a lot of replay value, but it’s not very inviting to new players. I’m playing it as well in 2017 and I’m having a hard time to find the “outside” of the city. Sure I found the open gate and randomly stumbled to the “troll of vergen” but where the f*ck do I go to reach the ravines where his she-troll is!